San Antonio Spurs all-star Tony Parker and Eva Longoria got dee-vorced last week, around the time it was discovered that Parker was doing some dribble-drive penetration with a former teammate's wife. NBA 2K11's latest roster update factors in the breakup. Parker's now rated "not loyal" for player management purposes (the background calculation went from an 87 to a 0, I was told) and his "steal" rating also got goosed up (to 79). Too bad Brent Barry, the cuckolded sixth man in this, still isn't in the league, he'd probably get zeroed out in "awareness." This kind of thing is becoming increasingly common as sports developers push out roster updates that react to real-life developments in the league. We've seen it in Madden, though not with this level of snarkiness. 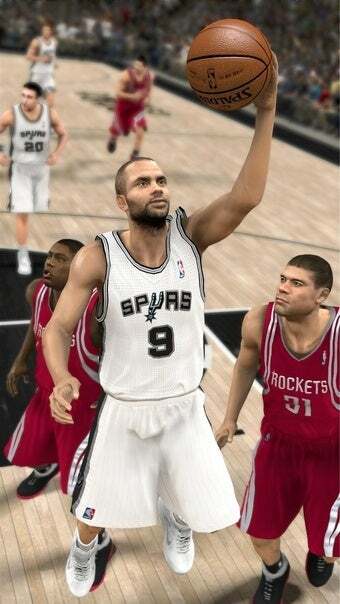 I'd say Parker's turn as the cover star of rival NBA Live (in 2008) probably figures in somehow. The roster update is one aspect of omnibus update 2K Sports rolled out early this morning, including a patch that tunes the game's shot stick, updates the Cavaliers' floor art, and fixes a number of freezes and hangs that occurred at certain points of the My Player and Association modes. For all of the patch details, see here. As for other Tony Parker attributes that may interest you: Shoot off dribble, 81; Ball handle, 94; Ball security, 88; Stamina, 91. His pull up or penetrate tendency, however, is 99 for pull up. Damn, now I'm gonna have to look at Delonte West's ratings.